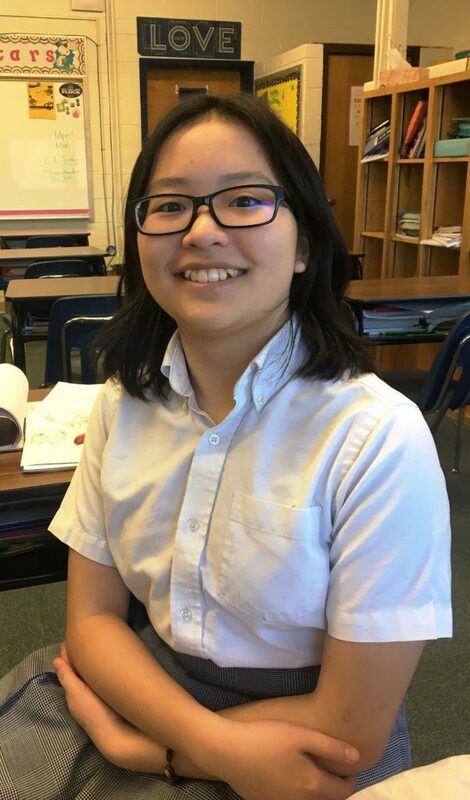 Congratulations to eighth grader, Anna Dang! She has earned a scholarship which will cover full tuition for four years at Mount de Sales Academy. This award from the Marian I. & Henry J. Knott Scholarship Fund is one of the most esteemed honor for students in Baltimore area Catholic schools. To apply, a student must have scored in the 94th percentile or above in Total Reading, Total Mathematics and Language on a nationally standardized test; and their grades must be all A/A+ or 93% -100% in major subjects. Anna was also recently awarded top honors in the state of Maryland for her stunning artwork for the Knights of Columbus Keep Christ in Christmas poster contest. This multi-talented young lady plays first-chair flute, is an accomplished violinist, and shares her gifts by accompanying our choir at weekly school Masses on Thursdays. Dr. Pellechia shared this news saying, “Anna and her family are overjoyed about this and so thankful for all that have helped Anna grow over the years. She is a remarkable student, and has given of her talents musically at Mass and with our Junior Legion of Mary. We know that she will go on to do great things in the years ahead. Thank you to all of you that have been a part of her education both in and out of the classroom and helped her to become the person she is today.” Anna joins the ranks of other OLPH alumni who are Knott Scholarship recipients. Elizabeth Weir and Andrew Sontag earned this honor in 2017, and currently attend Notre Dame Preparatory School and Calvert Hall College High School, respectively. Kelly Sliker, OLPH Class of 2014 attended Mount de Sales academy on a four-year Knott Scholarship as well.